Lower Byre offers weekly bookings starting on Saturday. Well equipped with TV, CD, DVD & radio. Lounge/dining room, kitchen, 1 double bedroom, 1 twin bedroom. Galleried study/bedroom area. Bathroom with shower. Garden. Off road parking. 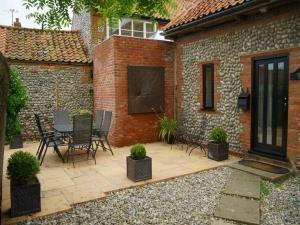 Lower Byre is located in the sleepy village of Weybourne, close to the towns of Holt, Blakeney and Sheringham. This beautiful barn conversion sleeps 4/5 people and is the perfect resting place after a long days exploring. It has been converted to a high standard. Totally non-smoking, Ground floor bedroom. No pets. Children welcome from any age. Approach Weybourne on the A149 coast road or the road from Holt. At the shop turn down Beach Road - Home Farm Rise is first turning on the left. If using public transport, Coastal Hopper bus service runs through the village. Please note this property is on split levels and may not be suitable for wheelchair users or persons with limited mobilty.